There are lots of online solutions for cleaning really burnt pots and pans, so Chef Joshna put them to the test. She praises this method as the easiest, most effective and quickest way to get your blackened pot back to its shiny former self. Because who has time to soak a pot overnight? We've all done it. Put a pot of something like rice on the stove, forgotten about it or didn't turn the heat down, and presto! Your beautiful saucepan has a burnt layer on the bottom. Scrape out as many loose bits of burnt food as you can with a wooden spoon. Don't use anything sharp or abrasive. Sprinkle baking soda into bottom of pan (about 2 tbsp per cup of water). 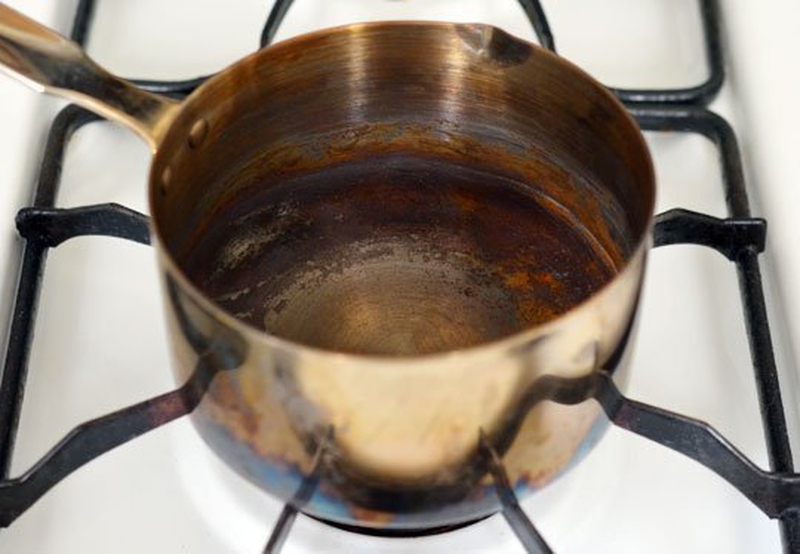 Add enough water to cover burnt parts by 1-inch and stir; water should look murky. Bring to a boil, reduce heat to medium and simmer for 15 minutes. Scrape bottom of pot with wooden spoon. Burnt bits should come right off! If any stains remain, sprinkle baking soda into the pan and add a few drops of water to form a paste. Scrub using a non-abrasive scrubbie. The remaining bits will come right off!